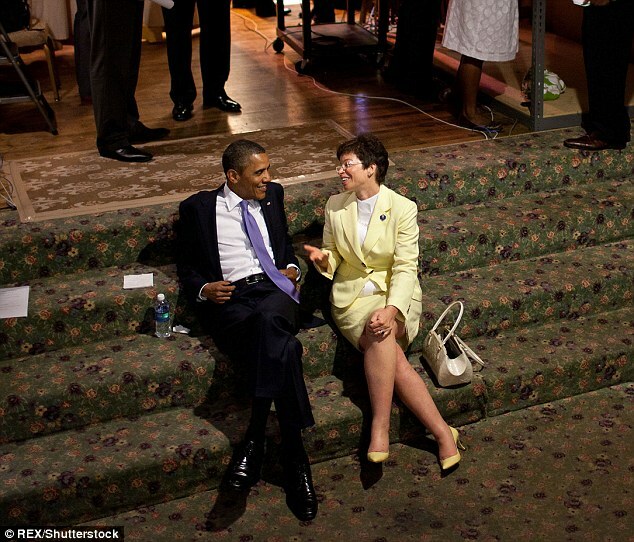 Jarrett played a vital – if at times low-key – role in the Obama presidency. She lived in the White House, dined with the Obamas, and help shape his domestic and foreign policies. The former president has set up an office on the West End of the national’s capitol, where he recently hosted an open house for his White House staff – including Joe Biden, Susan Rice, Josh Earnest and Jarrett. But the office, part of his post presidency perks, cannot be used for political purposes. The rent on his home is paid by him personally. On Tuesday, former Attorney General Eric Holder revealed that Obama is indeed getting closer to making his public reappearance in politics. 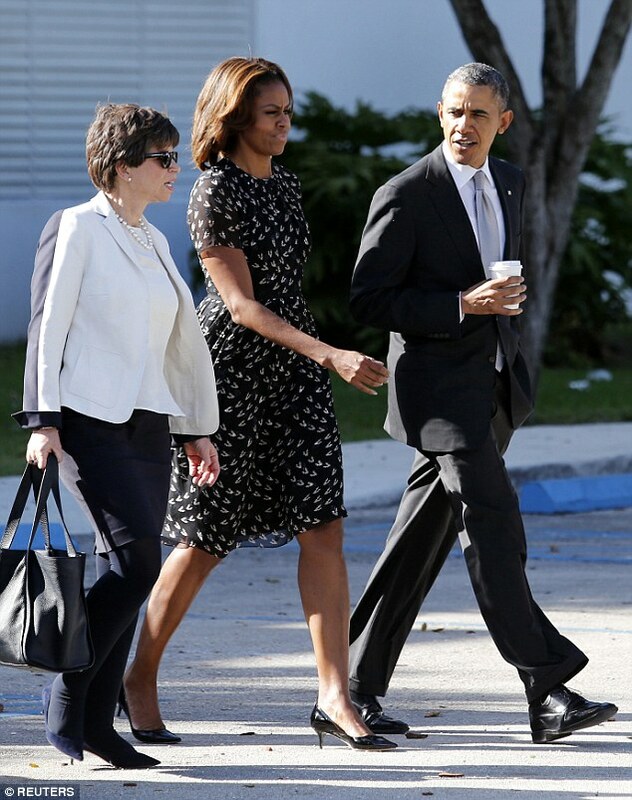 According to the family source, Obama was at first reluctant to assume the role of leader of the opposition. ‘No longer the most powerful man in the world, he was just observing Trump and not liking what he saw,’ said the source. In his only public comment against Trump since leaving the presidency, Obama came out in support of the protests opposing President Donald Trump’s executive order to restrict immigration from predominantly Muslim countries. After Obama left office, Jarrett moved all her White House belonging into the Kalorama mansion. ‘There was never any doubt that Valerie would have a suite of rooms in the house that the Obama’s are renting,’ said the source. ‘Obama trusts her judgment more than any other person on the planet, as does Michelle. Spurred on by Jarrett and Michelle, the ex-president has come to embrace his role as the leader of the opposition against Trump, whose policies he loathes and whose presidency he considers illegitimate. ‘He is going to use his immense popularity with the half of the country that identifies as liberals and progressives,’ said the Obama family source. ‘Millions of Americans are energized and ready to take to the streets to oppose Trump, but they need to be organized and have their anger focused and directed. ‘Obama is dismayed at the way Trump is tearing down his legacy—ObamaCare, the social safety net and the welcome mat for refugees he put in place,’ the source continued. Trump’s cabinet picks are also problematic for the former president, especially Jeff Sessions as Attorney General, whom Obama regards as too racially insensitive to be in charge of the Civil Rights division at Justice. Leaving Jim Comey as FBI Director is another thorn in Obama’s side. He blames Comey for announcing that he was reopening the FBI investigation into Hillary’s emails eleven days before the election, which, in Obama’s view, was an irresponsible act that helped elect Trump. ‘He had hoped to write his memoirs, golf to his heart’s content. and bask in the glory of his eight years in power and the progressive achievements he brought about. Instead, he is going to be leading the fight and strategy to topple Trump.’ says the insider. The Kalorama house, which the Obama’s are renting from Joe Lockhart, who was Bill Clinton’s press secretary, is still being refurbished and redecorated by Michelle. ‘Michelle and Valerie have changed their minds many times over about colors, carpets, wall paper, furnishing and art,’ said the source. Michelle hired Los Angeles-based interior designer Michel S. Smith, who designed several rooms in The White House during their residence, to decorate the Kalorama home. 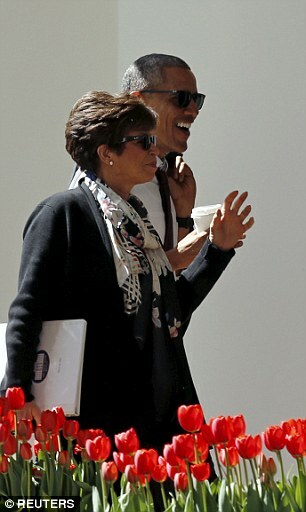 Smith will also decorate the Obama’s new home in Rancho Mirage, California. According to the source, Michelle and Valerie have big plans for traveling and shopping as well as strategizing over Trump. The friend said that Valerie and her signature enormous totes are going to be packed and ready to go for shopping sprees with Michelle from their native Chicago to Paris and the Far East, including Shanghai. ‘They feel like they have had some great trips while in the White House, but were always working and being herded around,’ said the source. ‘Now they are planning to travel together – home to Chicago, to Paris and Shanghai, and shop to their heart’s content. ‘The Obamas both love the Kalorama house and are making it their own,’ continued the source. ‘They have plans to build a pool on the grounds. And they are almost certainly going to wind up buying the house from Lockart in the next few years.